Note: Muscle pain caused by overuse (too much exercise or heavy lifting) is covered in Arm Pain. Cut - Shallow: Shallow cuts (scratches) only go part way through the skin. They rarely become infected. A scratch is an injury to the skin from a sharp edge. For example, a scratch can be caused by fingernails, a sharp nail, a piece of metal, or a branch of a tree or bush. A shallow cut or scratch can usually be treated at home. Making sure the wound is clean is the most important thing. Scrape: The medical term for scrape is abrasion. This happens when an injury scrapes off the top layer of the skin. An example is when a person falls and "scrapes" his or her elbow on a concrete sidewalk. Pain is usually mild. This can usually be treated at home. Making sure the wound is clean is the most important thing. Dislocation: This is when a bone comes out of the joint. The joint always looks crooked or deformed. The pain is severe. A person with a dislocated elbow or shoulder will not be able to use that arm. This is serious and a visit to the emergency department is needed. A doctor will treat this by putting the bone back into the joint socket. Fracture: This is the medical term for a broken bone. It means the same thing as a break or crack in the bone. The pain can be severe. A person with an arm fracture usually cannot use that arm. If the broken bones are not lined up right, the doctor may need to push them into the correct place. A hard splint or a cast is needed to protect the arm. This will also keep the bones from moving out of the correct position. Sometimes surgery is needed. Sprain: A sprain is the medical term used when ligaments around a joint are torn or over-stretched. Ligaments are the bands of tissue that connect bones to each other. They are often due to injuries from falling, heavy lifting, and sports. Pain and swelling can range from mild to severe. Minor sprains heal with time and rest. More severe sprains need a splint or a cast and take 4-6 weeks to heal. Surgery is rarely needed for a sprain. A direct blow to your arm can cause a contusion. Contusion is the medical term for a bruise. Strain and sprain are the medical terms used to describe over-stretching of the muscles and ligaments of the arm. A twisting or bending injury can cause a strain or sprain. It can also happen after lifting something too heavy. 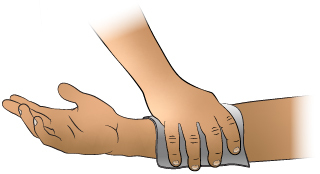 Wrap the injured part of the arm with a snug, elastic bandage for 48 hours. Sit down and place the injured arm up on a pillow. This puts the arm above the heart. It helps with pain and it decreases swelling. Small cuts, scratches, and scrapes should heal in about 1 week. It may take a week or two longer for them to fully disappear.